Leaving Winter Park on U.S. 40 just shy of 4 p.m. on Dec. 13, 2005 after a day at Mary Jane, I encountered the edges of a large storm just outside of Hot Sulphur Springs. The subsequent drive up and over Rabbit Ears Pass was treacherous, with snowy, white-out conditions and zero visibility. Road? What road? 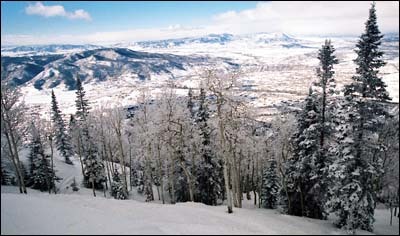 I arrived in Steamboat Springs at 7 p.m. white-knuckled but intact, anticipating a good powder morning the next day. I was not disappointed. Nor was I alone, as lots of other skiers happened to be be in Steamboat when the welcome early season storm rolled through. Steamboat ski area reported eight inches of new snow the next day, although there seemed to be much more deep in the trees. Cold, frosty, wonderful. The storm system I was chasing blew a chilly, snowy, foggy blast of winter onto the hill, frosting trees and creating excellent powder conditions. I spent most of the day skiing the Storm Peak lift, as terrain accessible here, especially in the trees, was full of untouched powder. With many skiers remaining indoors (congregated in the oppressive Thunderhead cafeteria), virgin powder remained well into the day. The wind, fog and snow created challenging conditions, making navigating the hill difficult. Trail signs were often shrouded in fog, so I skied where the hill and powder took me, not able to track routes or trails. Crowded lift lines at the Sundown Express lift kept me happily tracking new powder off Storm Peak, moving from one powder field to the next. Allowing the mountain “spirit” to guide me through soft blankets of snow proved to be a rewarding strategy. 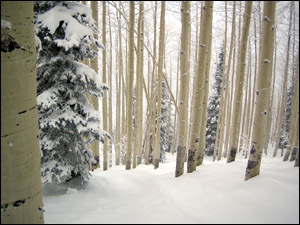 The Steamboat gems of Shadows and Closet were accessible from Storm Peak and yielded magical routes of snowy bliss. Finding untouched powder on Shadows is itself worth a death-defying ride over Rabbit Ears. Nearly as inspiring are the majestic views of the Yampa Valley, viewable this day through occasional openings in the cloud cover, offering a cool contrast to the foggy mountain conditions. Late day at Steamboat, when the sun peaks through, the light shines directly on Heavenly Daze and Valley View runs, creating golden shadows that add to the mystique of this classic ski mountain. Steamboat long ago graduated from “ski area with character” to full-fledged “destination ski resort.” Whether that’s good or not depends on your perspective. Yet beneath the shiny veneer of the resort, if you can elbow your way through Gondola Square, a truly captivating experience awaits the skier. 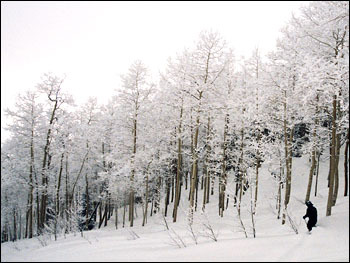 With its burgeoning, sprawling base “condo” area, Steamboat is more than capable of handling bus loads of college students, but deep in the woods on a powder day, the crowds fade and the challenge, mystique and alpine splendor of Steamboat shine through, even when the chilly fog descends.